Just don’t think of them as banh mi—think of them as banh mi inspired, a sandwich with Vietnamese roots that’s a fresh fast food wonder in its own utterly delectable way. It doesn’t matter that they aren’t authentic—they’re amazing. Every one of them I’ve had has been absolutely satisfying with crispy bread, crunchy daikon and carrots, fresh cilantro and of course savory fillings of flavorfully seasoned meat or tofu. And don’t call it fusion either; as far as I can tell, the sandwich is not fused with anything except insanely good flavor and mouthfeel. 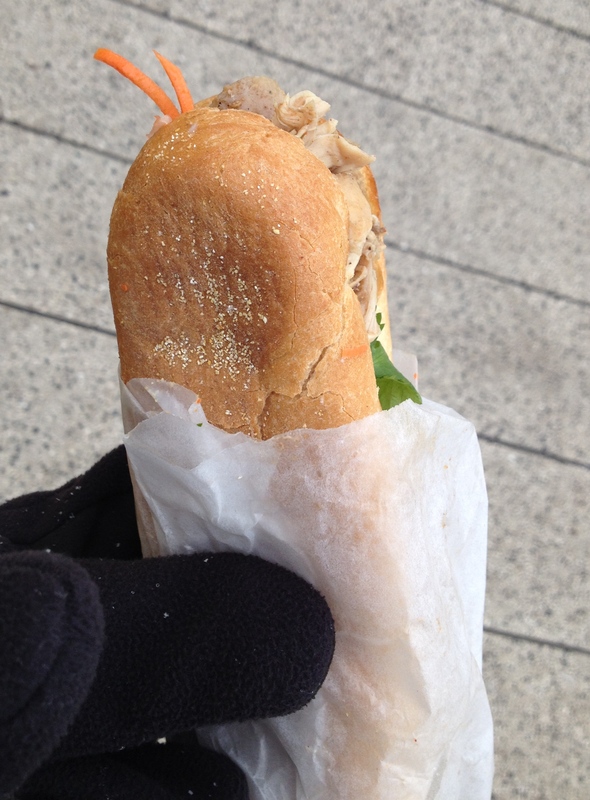 Whenever I’m near Harvard Yard or in Kendall Square, I have to get one of these from the Bon Me truck or restaurant. Prepared fresh in mere minutes, these sandwiches always delight me at first bite and thoroughly satiate me with the last. The one I was holding in this picture—the Szechuan peppercorn chicken sandwich—it was so good that although I only meant to take a bite, then be on my way, I could not stop myself from devouring it in minutes while standing in the middle of the Harvard campus as snow fell, not noticing how cold my hands were until I had consumed 3/4ths of the awesomeness. If you want something true(r) to the original, there are plenty of places around Boston where you can get one (Pho Viet’s is my fave), but if you’re looking for a tasty, well textured sandwich/meal/substantial snack, give the Bon Me sandwich a try. This entry was tagged asian food, banh mi, Bon Me, chicken sandwich, food truck, Harvard Square, Harvard Yard, sandwich, vietnamese food. Bookmark the permalink.